Hillary Clinton is trending up. The presumptive Democratic nominee just hit her highest point in the coveted RealClearPolitics average of several polls while growing her lead over presumptive Republican nominee Donald Trump to its largest gap since Trump clinched his party’s nomination in early May. Two polls released Sunday, one from ABC News/The Washington Post and another from NBC News/The Wall Street Journal, showed Clinton gaining support. 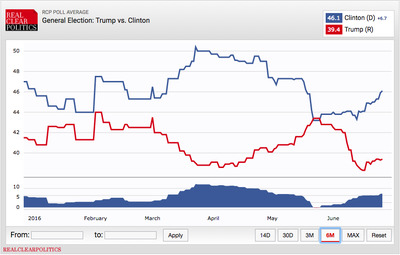 In the ABC/Post poll, Clinton went from trailing Trump by 2 points in August to leading him by 12 this month. She went from up 3 points in the May NBC/Journal poll to leading the Manhattan billionaire by 5 points in the latest survey. Clinton has bested Trump in 21-consecutive polls posted to the site since Trump overtook Clinton in the polling average in mid-May. Trump’s numbers have stagnated after bottoming out at a nearly year-long low earlier in June. He’s rebounded a bit, moving from 38.3% to 39.4%, but that bump has coincided with Clinton jumping from 44.1% to 46.1% in the RCP average. The swing has come as both candidates have offered differing responses to both the Orlando terror attack — the deadliest mass shooting in US history — and the British vote to leave the European Union, referred to as Brexit.